A group of students were made to pretend as prisoners and wardens. The wardens exhibited a love for their power while the prisoners grew more and more restless, even mutinous. Actual law officers needed to be called to bring order to the participants. 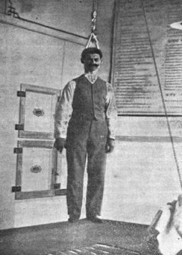 Forensic scientist Nicolas Minovici conducted the hanging studies by advising assistants to hang him as well as other people to see what happens when someone dies through hanging. Similar to the Hanging Studies, the crucifixion research aimed to figure out what a person goes through when crucified. The pathologist Frederick Zugibe did just that to his volunteers. 4. One year in bed. This 370-day research was done to find out the effects of weightlessness on a person while doing normal things like reading, eating, and everything else. Done to determine if pilots can be ejected from their supersonic jets during the WW II, Paul Stapp was the volunteer for this experiment where he was first ejected from 90 mph up to 200 mph. He did this in the course of 7 years, for a total of 29 times. Evan O’Neill Kane, an American surgeon, performed a surgery on himself to remove his appendix. The only problem encountered during the 30-minute operation was when his guts came out when he bent forward, but he was able to successfully excise his appendix. 7. Ingestion of non-food items. In 1878, Giovanni Battista Grassi infested himself with worms by ingesting eggs which he kept after an autopsy. This weird method even became some kind of rite of passage for some parasitologists. Stanley Milgram’s obedience experiment is one of the most famous examples of weird experiments. He asked volunteers to electrocute a patient, who was an actor pretending to be electrocuted until he died. Most of the patients only proceeded, and one of them even kind of laughed a maniacal laughter when asked to electrocute the “dead” actor. 10. Isolated live dog head. Sergei Brukhonenko was able to keep a dog’s severed head alive with the use of an “autoejector.” The dog’s head responded to stimuli by flinching, having dilated pupils, and even eating a piece of cheese which would just pop out from its esophagus. These science experiments are truly on the bizarre end of scientific activities.